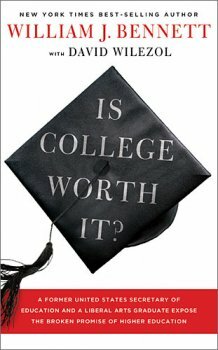 Book Review: Is College Worth It? As someone who has made a fair amount of blunders when it has come to higher education, blunders that are perhaps understandable in light of my background but blunders nonetheless, this book was definitely something that I took seriously and it is a book that I highly recommend for my young (and not-so-young) friends who are considering college and want information to make wise decisions based on their interests and ambitions and aptitudes (if someone is really interested and is closeby, I would be willing to loan the book directly or through a third party, as it is of vital importance for those who are entering college). This particular book is clearly written from a conservative position, and that is made plain throughout the book. Nonetheless, it is not a strident book, but is rather based on logical arguments and data that are often not brought into play in what is often a very emotional decision. William Bennett, himself a Ph.D in philosophy (and a former college professor and civil servant) and David Wilezol (a current graduate student) speak from experience. As someone with a couple of master’s degrees myself and an embarrassing and heavy burden of student debt, this book struck home with some personal resonance as well. Parents and students alike will find this book to be worthwhile as they seek to plan the best future for themselves and their families. This book is divided into five (fairly large) chapters along with some closing material that give more specific recommendations on higher education. First, the book looks at the borrowing binge, the harrowing burden of student debt that is rampant in our society, and of which I am a textbook example. Then the book examines, clinically and rationally, how the current financial mess of higher education came to be through extremely biased selection as well as guaranteed easy federal (and private) lending for often economically dubious decisions made often in the absence of accurate information about the true worth of many degrees. After this the book examines the lower side of higher education, in its seedy corruption and immorality in many circumstances, as well as its lack of commitment to standards of excellence in many cases because of its desire to continue the gravy train. After this, authors seek to provide prospective students (and their loved ones) with a clear-eyed and rational look at when college is worth it and when it is not, including a statistical analysis of those colleges and universities that are the biggest “bang for the buck” and which are not remotely worth their price of admission. The book then closes with twelve situations (none of which applied exactly to what I as like as a 17-year old, though a couple of them were close) as well as some colleges that are particularly worthwhile for specific types of people with interests in religious, liberal arts, online, or brick & mortar education. The book recommends that college is particularly useful to those students who are interested in studying in professions that really need college education for entry and who are serious and passionate about bettering themselves through education in such fields as engineering, law, medicine, or accounting. The book recommends that those whose inclinations are less academic should consider lucrative fields in skilled trades or those fields (like nursing) that require education between high school and a bachelor’s degree. The book also recommends the military or entrepreneurship for those who have other inclinations and varying degrees of commitment to studies, and examines thoughtfully such issues as the most (and least) lucrative professions as well as the bias against skilled trades because of the mistaken impression that they are low-pay and the low-status that comes along with such professions. For those who want a critical and realistic view of education and want to decide wisely in light of that information, this is an excellent work that deserves to be read. This entry was posted in Book Reviews, Graduate School and tagged business, culture, debt, education. Bookmark the permalink. 13 Responses to Book Review: Is College Worth It?